iMend Phones can diagnose your iPad Mini camera issues in a matter of minutes. Cracked or dirty lens, black spots or no image at all? Whatever the issue, it’s a simple repair for our qualified team. Take great photos again by calling us on 1300 046 363, filling out our online form, click the book online button or bringing your iPad Mini into our shop today @ 27 Cornmeal Pde, Maroochydore QLD 4558. 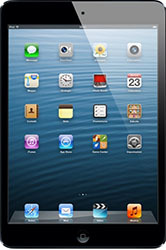 The iPad Mini’s main camera captures 5 megapixel images and features 1080p HD video recording, the same specifications as the iPhone 5. The front facing camera of the device is a 1.2 megapixel camera and 720p HD recording, which is mainly used for the device’s Facetime application. Cracks or scratches sustained to the device’s lens or problems experienced with the devices shutter system can be resolved when replaced with new parts. Take great photos again by calling us on 1300 046 363, filling out our online form or bringing your iPad Mini into our store today.